Members from KDWB’s Dave Ryan in the Morning Show put down their microphones and picked up handguns today in a private class with Blue Line Defense. 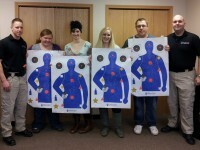 Crisco, Ashley, Katie and Jenny spent time with Blue Line Defense instructors and learned about practical uses of firearms and firearm safety. In the BLD classroom they received an overview of the Minnesota permit to carry program, legal use of force and handgun fundamentals. The morning show members were introduced to several different firearms, including handguns, shotguns and tactical rifles. After their classroom education we brought them into the gun range to shoot a variety of handguns and apply the information they learned. Many of them hadn’t shot a firearm before but after instruction from Terry, Paul and Mark, they were hitting targets like seasoned marksmen. Crisco said the time he spends playing Call of Duty is what made him a good marksman. It’s tough to say who had a better time, our staff or the staff from KDWB. It’s a great feeling to see the progression of someone who has never fired a handgun into the thrill they have while consistently hitting the mark. The excitement and smiles they showed are just proof that we have the best job in the world. We’re lucky enough to train some amazing people and we’re happy to welcome The Dave Ryan in the Morning Show to part of the Blue Line Defense family. We’re such big fans of what they do and appreciate that they took time out of their busy schedules to spend the day with us and see what we do.To see more photos from KDWB’s Dave Ryan in the Morning Show, click here. Last night, the Minnesota House passed The Defense of Dwelling and Person Act of 2011 (HF1467) on a 79-50 vote. The next step is getting it passed in the Minnesota Senate. We’ll update you when we have some idea on scheduling.